A new programme special on the music phenomenon that has swept the world! 5 Seconds of Summer are not just another boy band - the four teenagers from Australia have risen from obscurity to global mega-stardom in the blink of an eye and this programme traces the rise of 5SOS, from their humble beginnings in a Sydney suburb, to sell-out stadium rockers! When their highly anticipated debut album entered at Number 1 on the US Billboard chart, Luke, Michael, Calum and Ashton sealed their place as the hottest band on the planet with 5SOS topping the charts in over 40 countries. 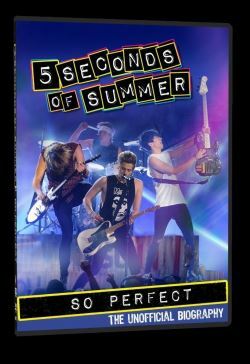 Combining unique archive footage and compelling exclusive interviews with colleagues, music industry insiders and of course the fans, this electrifying documentary is packed with the very latest 5SOS interviews from their 2014 UK tour and footage of 5SOSERS from around the world! This programme is not authorised by 5SOS or their past or present management.